Charles Robert Lambert [Bob], beloved husband, father, grandfather, great-grandfather, and kind friend to any he associated with, died peacefully Tuesday morning, December 4, 2018, in his home. Born February 19, 1930, Dad was raised in Fillmore, Utah, by his loving parents, Charles Philip and Mildred Snyder Lambert. He and his sister Phyllis learned how to work by growing up on their grandfather’s farm, of which he had very fond memories. Throughout high school and college, Dad excelled as an athlete in football and track. His love of sports stayed with him throughout his life. 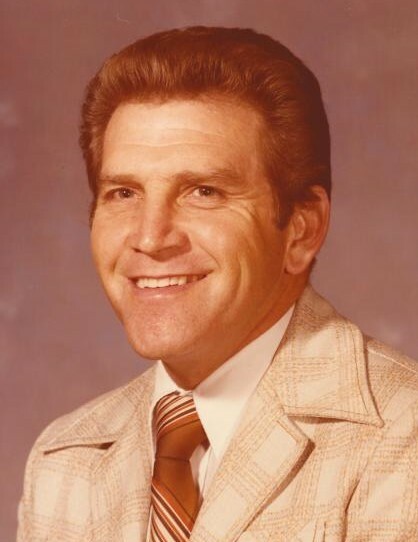 He supported all his children in their athletic interests and loved to follow all sports – especially BYU football, the Utah Jazz and the Olympic games. Dad attended the Branch Agricultural College [BAC] in Cedar City, Utah, and graduated with a B.S. in Elementary Education. Many former students have said that he was their favorite teacher and are forever grateful for his positive influence in their lives. It always warmed his heart when a former student would recognize and greet him with a smile and words of gratitude. As a member of the U.S. Army, Dad proudly served his country during the Korean War. He was trained as a Radio Teletype Operator with the 24th Infantry Division. While his division was in Japan and waiting to mobilize to Korea, Dad was reassigned to teach basic English to illiterate and non-English speaking soldiers at the Army Education Center on base. Many of those soldiers felt indebted, and thanked Dad for the life-changing education they received. After completing that assignment, Dad was reassigned to Pusan, Korea where his division was heading for the front lines. He was extremely anxious because a large amount of time had passed since he was trained. He was no longer confident in his skills using the teletype machine. He prayed mightily to his Heavenly Father for help. After boarding the transport truck headed for the front lines, he was humbly relieved to hear his Sergeant call out, “Lambert! I don’t know how you do it! You’ve been transferred to the PX (Post Exchange).” Dad knew Heavenly Father had intervened once again. Shortly after serving there, the Cease Fire was signed. He stayed at that assignment until his term of service had ended. Dad married the love of his life, Lorena Lamb, in the Salt Lake Temple on August 17, 1955. They had nine beautiful children but lost their precious Jay Robert just hours after he was born. Together, they raised eight children. Dad made each child feel special through his love, and with the most tender heart. He made special memories with each child. He sacrificed what little time he had to be with his family. As a school teacher, Dad taught the 5th and 6th grades for 33 years. He spent most of his teaching career at Beacon Heights Elementary School and retired there. With eight children to support, he worked side jobs at Skyline and Redwood Road gas stations, Prestwich Farms restaurant and Eldredge Furniture. His warm personality endeared all whom he interacted with. Dad loved the outdoors. As a dedicated Scoutmaster, he led many young men on hiking trips through the Wind Rivers, bicycling to and from Bryce Canyon and building kayaks to float across Yellowstone Lake. He regularly blocked out two weeks each summer to vacation with his large family. He particularly enjoyed fishing at Navaho Lake, hiking throughout Zion and Bryce Canyon National Parks and camping in various locations throughout Utah, Idaho and Colorado. He had many hobbies. Growing up on a farm, Dad enjoyed horseback riding and had a love for growing a vegetable garden. With a large family to feed, his gardens were large and very productive. He enjoyed cooking and was a master at baking bread and pies. Dad loved history and enjoyed reading anything non-fiction. He was blessed with creativity and loved working with his hands. Dad made beautiful set designs for his school’s plays, oil paintings, drawings, wood carvings, and blankets of crochet. He actively served others as a member of The Church of Jesus Christ of Latter-day Saints. In addition to his ward callings, he served with his wife, Lorena, in the Jordan River Temple, Utah State Prison, Inner City Salt Lake City Mission and Joseph Smith Memorial Building. Dad’s life was one of service. Dad is survived by his sweetheart of 63 years, Lorena Lamb, and eight of his nine children: Scott C. Lambert (Claudia), Jay R. Lambert (deceased), Connie Harris (Paul), Ilene Abbinanti (Martin), Mark R. Lambert (Melanie), Janet Bird (Greg), Lisa Johnson (Scott), Douglas E. Lambert, and Jason P. Lambert (Kim). He cherished his 33 grandchildren and 17 great-grandchildren. He is also survived by his sister Phyllis McKee and preceded in death by his sister Joyce Renee Lambert. A viewing will be held Friday, December 14, from 6-8 pm at the Cannon Mortuary, 2460 East Bengal Blvd. (7600 South), Salt Lake City, Utah. A funeral service will be held Saturday, December 15, 11:00 am at the Butler West Stake Center, 1845 East 7200 South, Salt Lake City, Utah, with a viewing preceding the service at 9:30 am. The internment will be held Monday, December 17, 1:00 pm at the Utah Veterans Cemetery & Memorial Park, 17111 South, Camp Williams Road, Bluffdale, Utah.